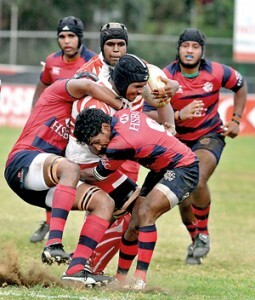 Navy Sports Club put an end to defending champion’s Kandy SC’s unbeaten run when they scored a convincing 25 Points (3 Tries, 2 Conversion, 2 Drop Goals) to 14 Points (2 Tries, 2 Conversions) win at Welisara in a key Inter Club Dialog League Rugby encounter yesterday. At the half time Sailors led 15-14. Though Kandy played well in the initial half they lacked their finishing touches. The difference between the two sides was the expatriate players. For the Sailors both Stefano Cakua and Ratu Taniela played well and marked the Kandy players well. In loose play Kandy played well with Sean Wijesinghe having an outstanding game both in defence as well as in attack. He found several gaps in the Navy defence in the first half and his attack was a constant occurring which kept the Navy defence with lot of tackling. After the turn around, Navy played well combining well as a unit. One of their Expatriate player Ratu Taniela Rawaqa who was yellow carded in the first half for a high tackle on Saliya Kumara was involved in another brawl and was shown the Red Card by the referee. Sailors Fly Half and former Kingswood Fly half Dev Anand had an outstanding game. He contributed with 10 points with 2 drop Goals and 2 try conversions.� From the forwards it was the omnipresent Bilal Hassen who impressed the large crowd being in the thick of things. His hand off and brave moves were a repeated issue for Kandy who did not have answers on most occasions. With this win, after the completion of the first round, all three sides namely Navy SC, Kandy SC and Havies have suffered a defeat each with no team remaining unbeaten. Kandy SC, Navy SC, Havelocks SC and Up Country Lions will battle it out in the Cup Segment starting next week-end. Navy SC drew first blood in the 8th minute of the game when their star fly half Dev Anand was on target with a Drop Goal. Four minutes later Skipper Yoshitha Rajapaksa powered his way through for the Sailors first try of the evening. Dev was not accurate with the kick at goal. Kandy who kept on attacking broke through for a Sean Wijesinghe try. Fly Half Roshan Weeraratne was on target with the extra 2 points to reduce the deficit to one point (8-7 Navy). Kandy took the lead through a Centre Pradeep Liyanage try with Roshan Weeraratne adding the extra 2 points. But the lead was short lived as ever green Bilal Hassen brushed aside a few Kandy defenders to touch down. With Dev Anand adding the extra 2 points Navy took “Lemons” at 15-14 lead. After the turn around second rower Kalana Amarasinghe touched down and Dev’s boot was a golden one as he was on line with his second drop kick to take Navy home with a comfortable 25-14 win. This is the 4th time Kandy was beaten at Welisara. CR & FC regained their winning ways when they inflicted arch rivals CH & FC with an energetic 43-20 win in their Division A club rugby match at Longdon Place. CH enjoyed a brief lead in the first half but CR who drew first blood off a penalty bounced back with a converted try to go into the breather 10-all. After the turnaround CH were dispersed by CR who went on to score off five more tries and four conversions. CH managed to retaliate with two unconverted tries to complete their points tally. Havelocks Sports Club pulled off a stunning 32-22 win against Upcountry Lions in their Division A club rugby match at Nawalapitiya. Both teams battled intensely during the first half to gain control over each other but the Havies proved their might to edge through with an 8-5 lead at half time. Soon after the turnaround the Havies scored freely to expand their lead by a massive margin but Upcountry Lions too gave the visitors some torrid times by making a strong reply to trail by 27-22. However the Havies scored five tries, two conversions and a penalty in reply to four tries and a conversion by the home team.